Aqualux is a brand-new hotel characterised by modern interiors, interesting architecture and extensive wellness facilities. 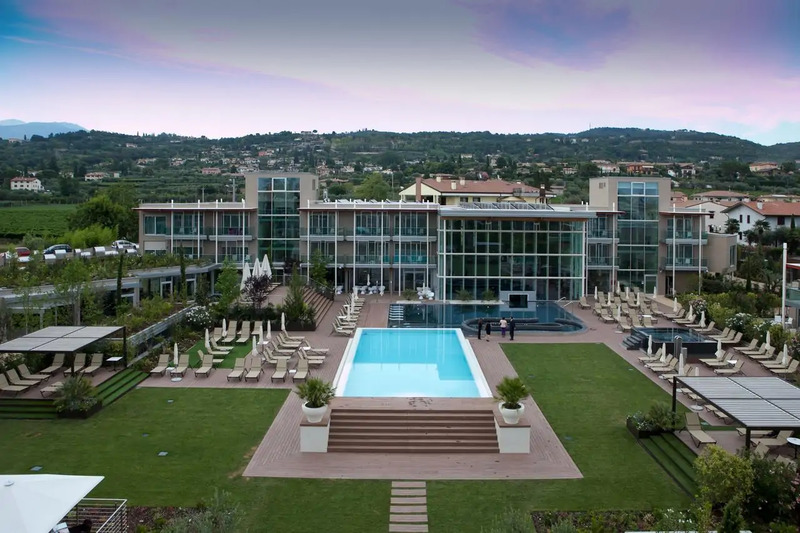 It is set in Bardolino on Lake Garda at the foot of Monte Felice. Parking is free. Aqualux Hotel Spa & Suite is an eco-friendly property with a geometric square design, totalling 17,000 m². Its lobby features large windows overlooking the courtyard and water area. There are a total of 8 piscinas, both internal and external. The free AquaSpa & Wellness is 1000 m² and includes a gym, sauna and Turkish bath. A range of massages and tanning beds are also available. A buffet restaurant is open at breakfast and dinner, while an à la carte restaurant offers lunch and dinner. There is a bar indoors, and a poolside bar during summer. The swimming pools are open from May until September. Rooms are elegant and spacious, each one with large windows and most have a private balcony. Every room is air conditioned and soundproofed and includes an LCD TV, minibar and tea and coffee making facilities. The nearest beaches on Lake Garda are just 800 m.